My hubby is an wing killer. I really mean it. I can’t even describe how much he loves chicken wings. So, for 3days weekend I made wings for him! It can not be more easier and better!!! I’m telling you, this is one of the great sauces that I’ve ever made!! It’s so great because it needs only 2 ingredients for the sauce!!! I couldn’t wait to share this fun, easy and simple recipe with you guys!!! So, here is the recipe!! Fry the wings few at a time, turning as needed, until cooked through and nice golden brown. It will takes about 12 to 15 minutes. Drain fried wings on a paper towel lined baking tray. Make sure the oil returns to 350 to 365 degrees before adding the next batch. Meanwhile, Heat a small sauce pan over medium low heat; Add honey, sriracha and salt. Whisk until combined well. Do not bring to boil or simmer. We just want to heat up the honey so it will blend well with other ingredients. Reserve a 1/4 cup of sauce for serving. Add fried wings in a large bowl and pour honey sriracha sauce over them. Toss until well combined and wings are well coated. 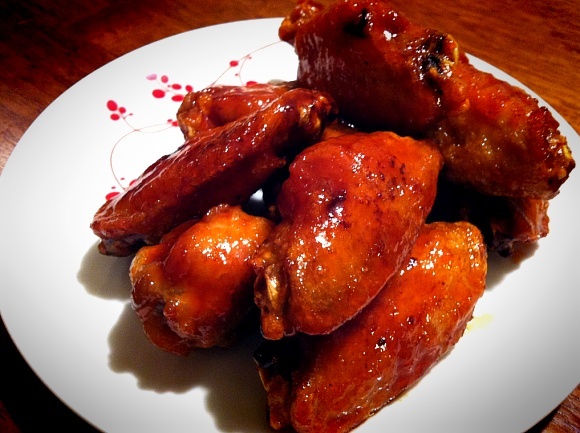 I hope you enjoy this simple and delicious wings at your home!!! Yes!! I cant wait to try this recipe! Im not very good at cooking but I think I can do this 😉 thank you so much for sharing! I’m so sorry for late reply! It’s clean bottle and green top.